Home Tags Posts tagged with "digital footprint"
Digital Citizenship Week (October 16 – 22) is the perfect time for you and your students to reflect on the role technology plays in your lives. It’s an opportunity to stress the importance of positive online habits, to learn about digital safety and responsibility, and to encourage acts of kindness. 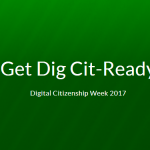 During a recent Lunch and Learn webinar, we shared some tremendous resources to help you celebrate Digital Citizenship Week. Whether you’re looking to celebrate just this week or throughout the year, we have activities and resources that are sure to help you. The latest social media app that all the kids are crazy about is the New Nice App. The app comes with a twist—it’s nice. The tbh app, short for “to be honest,” works by letting users send anonymous compliments to their friends and contacts. That being said, I created an activity that focuses on being kind. With this Google Slide activity, students write three kind things they will do. Next, they design their friendly ghost. The ghost doesn’t even have to look like Casper! Try it here by choosing an empty slide and listing three nice things you will do today. Get a copy of this Three Kind Things Ghost Activity here. A digital footprint is a trail of data you create while using the Internet. It includes the websites you visit, emails you send, and information you submit to online services. Have students think about what their digital footprint will look like 10 to 15 years from now. Allow them to illustrate their footprint with words, images, or videos. Try it here by choosing an empty slide. 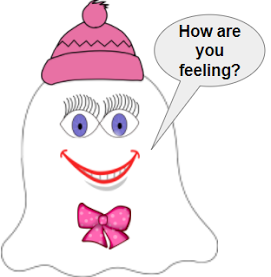 Get a copy of this Positive Digital Footprint Activity here. Being a good digital citizen is more than being a safe Internet user. It’s about being responsible and smart and having respect for yourself and others. Have your students engage in conversation about the importance of being a good digital citizen through Flipgrid. Check out this example from Berkeley County School District, where elementary students responded with their thoughts. Try it out by responding at https://flipgrid.com/aa3f8a. If prompted for a code, use aa3f8a. Don’t forget to visit the blog Google-ize Your Digital Citizenship that I wrote last year. It contains more activities, such as a Digital Citizenship Pledge, a Responsible Use Policy Scavenger Hunt, and more. Below are more awesome resources to take advantage of. 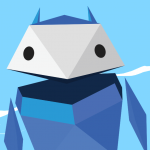 Be Internet Awesome – Google, in collaboration with online safety experts, developed the Be Internet Awesome program. The program teaches the fundamentals of digital citizenship and safety. In addition to a curriculum for teachers, the program includes Interland, an online game that puts these critical lessons into hands-on practice for students. BrainPOP’s Free Digital Citizenship Resources – BrainPOP’s free digital citizenship resources offer schools ready-made learning pathways. These pathways explore topics such as Information Privacy, Media Literacy, and Digital Etiquette. Be sure to check out the Teaching Resources, too. They include a guide, video overviews, rubrics, and lesson plans. More information can be found at Making the Online World a Better Place Starts With You. Get registered here. Common Sense Media Digital Citizenship Week Activities – Common Sense Media lists activities you can do to celebrate kids using technology safely, responsibly, and respectfully. Below are a few resources from Common Sense Media. Microsoft Educator Community Digital Citizenship Resources – The Microsoft Educator Community offers a digital citizenship course for educators. 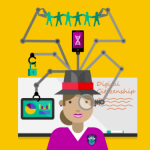 Educators can earn a “Microsoft Digital Citizenship Champion” badge that can proudly be displayed on their profile once they complete the course. Furthermore, educators get access to a OneNote Notebook full of resources and lesson plans. 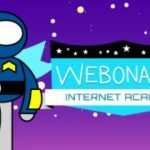 PBS Webonauts Academy – Webonauts Internet Academy is a web game for 8-10 year olds. It gives them an opportunity to have some fun while exploring what it means to be a good digital citizen. It is quite engaging. In addition, it becomes all the more powerful when parents and teachers use the game to spark more conversations about digital citizenship. 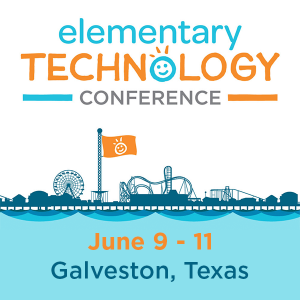 Remember, the ISTE Student NETS #2 is itself called Digital Citizenship. As you build digital citizenship lessons, look at the indicators. These will help you in creating clear targets that students will understand and can achieve. Let us know how you are celebrating Digital Citizenship Week in the comments below. In addition, don’t forget to register for our Lunch and Learn webinars.